Get affordable Security Camera installation on Bell Gardens, CA and CCTV equipment with commercial quality and 2 years warranty. The best technology on security cameras systems is the IP camera system. This kind of system can use your router or switch to connect the cameras. With especial software you will be able to see the video of your camera, and do the recording. In a professional setup this cameras must be connected to a digital video recorder called “NVR” (network video recorder). The NVR has the function of recording digital video on a hard disk; sometimes this NVR can provide power to the cameras (PoE, power over Ethernet). If the NVR doesn’t provide power to the cameras, there are special devices called PoE switches to power the cameras. Another function of the NVR is to assign to each security camera a unique IP address. Protection4less offer you IP cameras with resolutions from 2 megapixels (1080p), up to 6 megapixels. If you are interested in 4K resolution, you’ll get the best price with us. The only problem with IP security cameras technology is when the camera sees moving objects. When we have resolution of 2 megapixel the fps is 30 fps (real time), but when we have resolutions of 3 or more megapixels the fps is reduced. When you have fps less than 30 fps and the security cameras are watching people running, or cars at a high speed they will appear blurry. In the future we will have highest resolutions at 30 fps, or more. 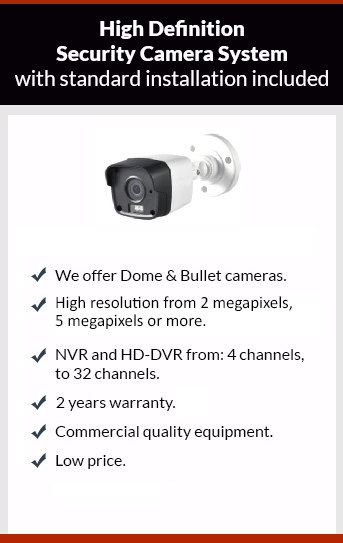 Our recommendation for our customers at this time is to get security cameras with 2 megapixels at 30 fps.